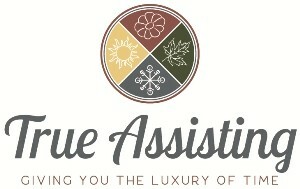 As the name might suggest, a personal assistant is all about helping YOU! Whether it’s your home, your office, your schedule or your finances a PA helps you wrangle all the different areas of your life into something that’s manageable and doesn’t cause you undo stress or worry. Let’s face it, life gets hectic. Stress happens. A PA makes it easier to deal with. Think about your to-do list. There’s likely tasks piling up. Only those that rise to the top because they can no longer be delayed get done. Often times, this delay causes something that might have been inexpensive to increase in cost. For example, putting off scheduling the furnace cleaning may lead to needing to have the furnace replaced. It’s also pretty likely that you’re not going to ask for help with these seemingly “small” tasks. You don’t want to bother people, or maybe you’re not sure who to ask. Lucky for you, that’s where a personal assistant comes in. 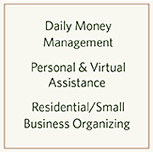 Another way a PA who’s also a daily money manager (DMM) helps you is by taking over the often time consuming tasks related to managing your budget and paying bills. These are highly necessary, but often wind up being put off. The power company doesn’t care how busy you are, they just want to be paid on time. Delegating your daily money management tasks to a DMM keeps everyone happy. Delegating some of your to-do list to a personal assistant relieves you of the stress and responsibility of getting them done. It saves you time and gives you peace of mind. You meet with your client and spend time with your family, a personal assistant will pick up your dry cleaning. You go on vacation or go for an extended workout, let a personal assistant monitor incoming calls and emails. You focus on figuring out the guest list, while a personal assistant makes your vision of the event come true. You know the saying, “if you want something done right, do it yourself.”? Many people fear that delegating tasks to a personal assistant means they won’t be done according to their specifications. Following a few best practices helps ensure your PA knows what you’re looking for and will complete delegated tasks to your satisfaction. Whether you’re an overworked executive or a busy working mom…or both, you’re pressed for time and worried about budgets. You may feel like you’d love to hire someone to help you, but you can’t afford it. The truth is, you can’t afford not to. We all know time is money. What’s an extra hour or two either alone or with your family worth? Put a number on it. Is it $20? $40? $100? Now, think about your budget. Do you have that amount of money to spend a day? A week? A month? Wouldn’t your time and money be better served spending that amount of money to buy yourself some extra hours? In a recent survey, 86% of working mothers asked said they sometimes or frequently feel stressed. Chances are that percentage is similar for executives or small business owners, though they’re less likely to be asked. How much is it worth to you to reduce that stress? Stress has been linked to nearly every major medical problem. Too much stress can lead to heart attack or stroke. It can cause indigestion, headaches, sweating and a host of other physical symptoms. Excessive stress can also have negative impacts on your emotional well-being. People with high stress for an extended period of time often suffer from anxiety, depression, excessive tiredness, reduced productivity and many other issues. While you’re able to put a price tag on your time, there is no price for keeping in good health. Doctors can prescribe pills to mitigate many of these issues and may recommend exercise or other lifestyle changes. What they can’t do, however, is reduce your stress. The good news is – you can! Ironically, the thought of delegating may cause you additional stress at first. Once you’ve established a relationship with a PA you trust, however, delegating to them dramatically reduces your stress level. Try it and watch your overall health improve. Plus, you’ll have more time to spend with family and friends. 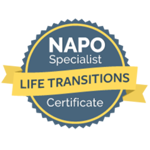 Ready to take the stress out of your life? Start delegating tasks to a personal assistant today. If you’re in the Southern NH, Merrimack Valley or Boston-North areas, True Assisting stands ready to serve you.